Superb colour output and unrivalled versatility are among the best features of the Oki C931 graphic arts printer, a device aimed at the graphic arts market. It's also praised for fast print speeds, lower running costs and flexible paper handling. The Oki C931 A3 colour laser printer may not be the best choice for medium to large workgroups with more demanding colour printing tasks, though. This is a four-colour A3 single function printer that is powered by a 1.2GHz processor and runs on 2GB of RAM. It weighs 97.6Kg and measures 640mm tall, 625mm deep, and 588mm wide. The base unit of the Oki C931 colour and mono printer has a 530-sheet paper tray and a 300-sheet multi-purpose tray. The operator panel's centrepiece is the colour graphic 10.9cm LCD screen. The duplexer is a standard feature in the Oki C931. The maximum paper capacity is 2,950 sheets with up to five optional paper trays. It supports a wide range of fonts and barcodes, and the print quality is easily enhanced by ProQ2400 multi-level technology and an auto colour balance feature. The C931 colour LED printer can automatically detect the media being used, and it can print in speeds of up to 50ppm in colour and monochrome on A4 sheets. Users may upgrade the device with a 160GB hard disk drive. Ultra-high capacity Oki C931 toner cartridges can print up to 38,000 pages per colour to reduce waste and minimise running costs. It can take almost a minute for the C-931 printer to warm up. This device lacks direct printing options. The resolution is limited to 1200x1200dpi, which may not be enough for images with higher resolutions. 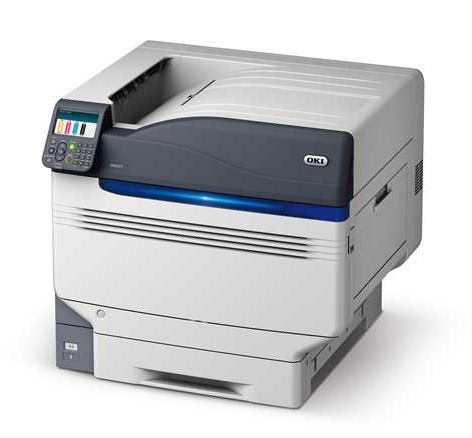 Despite the compact appearance, the Oki C931 A3 colour printer is heavy and can be difficult to transport or set-up. It can be noisy while printing.